Nothing quite like making a sewing plan and then getting sick. Long story short, I have some catching up to do on the January outfit. It’s ok though because I am ahead on sewing for February. The plan for this month is simple enough. One dress. I actually made it a couple weeks ago, in between sick days, snow days, and other stressful bits. I’ll write it up in the next post once I have pictures. I’m sticking with the same shoes as last month, and a handbag and jewelry I already own. The scarf, we’ll see. I have some options already – one that’s a wrap similar to the one shown, and one handknit (my red Viajante). And this is it for today. I’ll be back next week to show you my new dress with the scarf options. 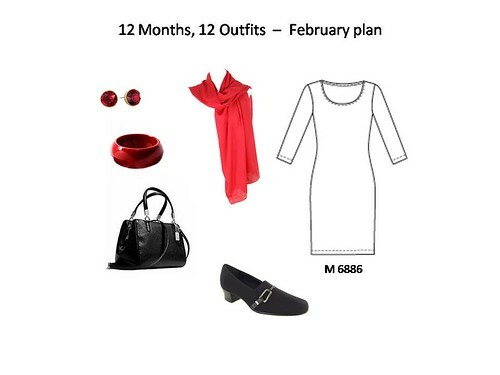 This entry was posted in wardrobe planning and tagged capsule wardrobe. Bookmark the permalink. Looking forward, I know it will be lovely!